Topal Bay (also known as Topal Sea) is a large, placid body of water south of Tamriel. It is enclosed by the provinces of Elsweyr, Black Marsh, and Cyrodiil. In Cyrodiil, the city of Leyawiin and the Blackwood region lie on Topal Bay, at the delta of the Niben River. 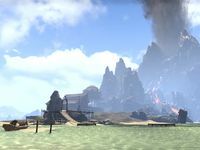 The bay's western shores are defined by Elsweyr's Quin'rawl Peninsula, where a great deal of smuggling occurs. The bay is named after Topal the Pilot, the Altmer explorer who discovered the Niben River and charted Tamriel's sea lanes. The bay's coastline to the east with Black Marsh has long been notorious for rampant piracy. The bay also flows into the Onkobra River, which supposedly leads right into the heart of Black Marsh. The Khajiit believe that moon sugar is "crystallized moonlight" caught by the waters of the bay and brought to the sugarcane groves of the Tenmar Forest by the tidal forces of Masser and Secunda. The access the bay allows to the Imperial City and many other settlements makes it of vital strategic importance, and the Aldmeri Dominion has been known to threaten the bay with their navy many times throughout history.